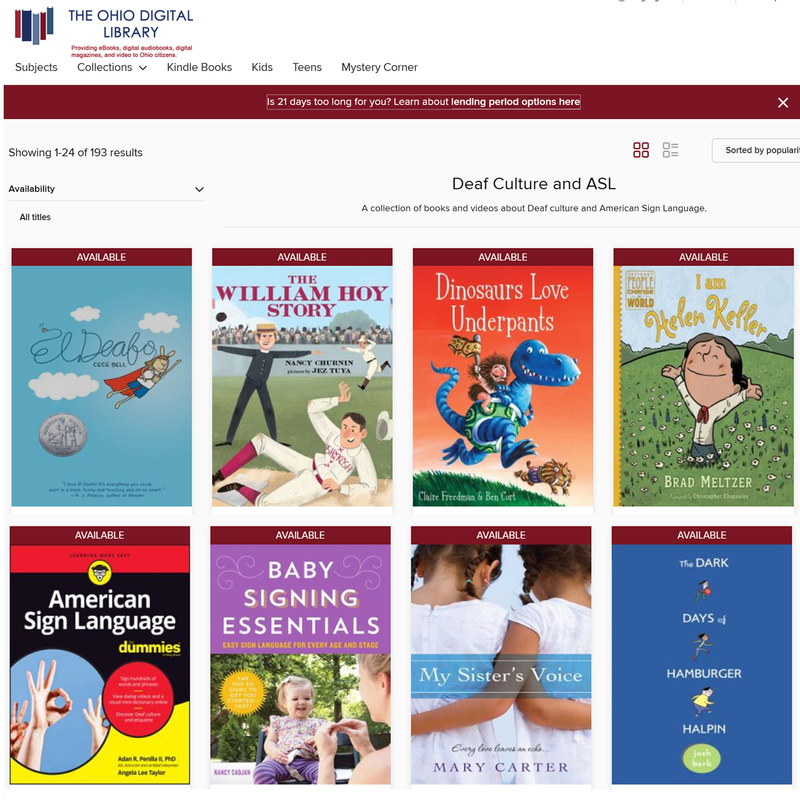 The State Library of Ohio is pleased to announce the Ohio Digital Library now includes a collection of eBooks and videos about Deaf culture and American Sign Language (ASL). The collection includes fiction and non-fiction for children and adults and covers many aspects of Deaf culture and ASL including language, history, education and instruction. The Deaf culture and ASL collection was developed by an Overdrive Account Analyst with a B.S. in American Sign Language Interpretation. With nearly 200 titles, the collection provides a beneficial resource to help increase awareness with the goal of bridging the gap between hearing cultures and Deaf cultures in today’s society. The State Library of Ohio provides audiobooks and eBooks through the Ohio Digital Library to provide digital resources for State Library patrons and Ohio Digital Library member libraries’ patrons. Audiobooks and eBooks selected for the Ohio Digital Library reflect a broad spectrum of viewpoints and reader interests including life-long learning, health and wellness, literature, and more. The Ohio Digital Library is a consortium of 176 Ohio public libraries. The libraries share a collection of digital media that includes eBooks, audiobooks, magazines (periodicals) and video. Started in 2005 as the Ohio eBook Project, it is funded in part by LSTA funds awarded by the Institute of Museum and Library Services to the State Library of Ohio.